Researchers at Cal Tech make progress cracking the code of water’s atomic details. WASHINGTON, D.C., December 17, 2018 — Interactions with water dominate how drug molecules bind to targets, but it’s tricky to model these interactions, limiting the accuracy of drug design. In a recent paper in The Journal of Chemical Physics, from AIP Publishing, William A. Goddard III and Saber Naserifar from the California Institute of Technology describe their novel approach to building a new description of water (known as a force field) and demonstrate its accuracy. Goddard, a professor of chemistry and applied physics, was “flabbergasted” by the results. “The description we get fits nearly all properties of water unbelievably accurately, far better than any previous force field,” he said. These incomplete models restrict drug design and limit our understanding of industrial solvent reactions, fueling scientists to investigate some of water’s anomalous characteristics. For example, it has been suggested that when water is supercooled to low temperatures it may exist as both a high- and low-density liquid, an anomaly that could be understood much better if a good force field for water were available. Unlike previous force fields, Goddard and Naserifar focused on modeling the individual interactions of water. Working “backward,” they first considered long distance interactions, and then added charges and polarization dynamics. “Previous force fields didn’t allow charges to move around, this is an important advance,” said Goddard. 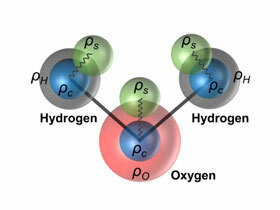 Also, for strong hydrogen bonds, the team utilized recently published, highly accurate, water dimer calculations. Their new force field only failed on one property: calculating how fast particles spread, or the diffusion constant. Goddard and Naserifar are “puzzled” by the irregularity, but remain excited by what their force field has achieved. They’re keen to use it to investigate the anomalous properties of water, and to see if it improves drug design accuracy.